Guidelines and updated emergency medicine (EM) practice parameters have been issued for the management of anaphylaxis in the ED, but research indicates that significant knowledge and practice gaps persist. In July 2011, a round-table meeting called Anaphylaxis in Emergency Medicine was conducted, consisting of a multidisciplinary group of experts who reviewed the current guidelines and how they are applied in different emergency medical settings in the United States. The experts agreed that the root cause for many treatment gaps for anaphylaxis was the lack of a practical definition of anaphylaxis as it relates to EM. In 2013, Dr. Nowak and colleagues published an article in the Journal of Emergency Medicine that customized anaphylaxis guidelines for EM. 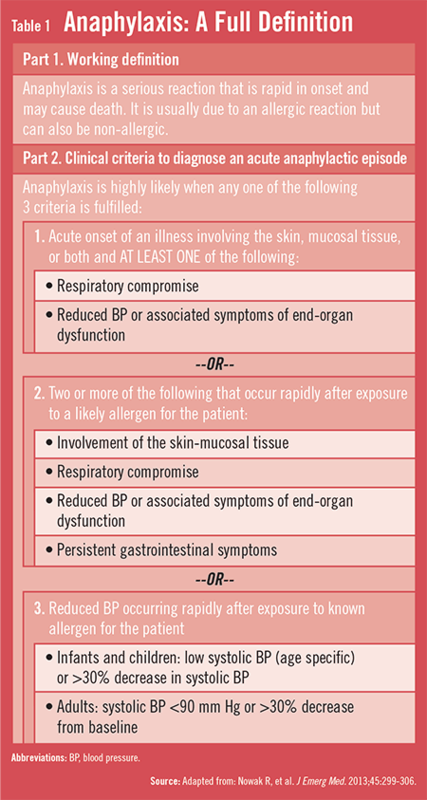 Articulating a simple standardized practical definition of anaphylaxis and describing characteristic findings in the clinical criteria for identifying it were an important emphasis (Table 1). The working definition was modified, building upon definitions suggested by other groups, so that it is clinically more relevant to emergency providers. “Diagnosing and managing anaphylaxis in the ED will be different from that of allergy clinics,” says Dr. Nowak. 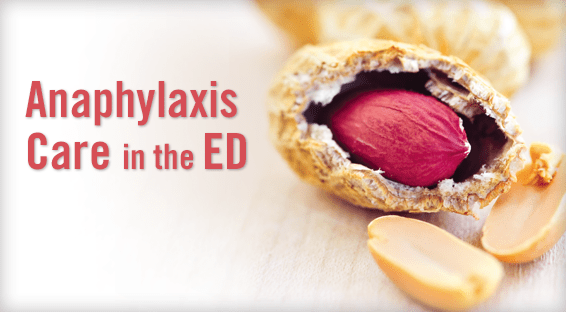 Much of the anaphylaxis literature is published in allergy journals, but the ED is the most common setting for treating it. The article also notes that anaphylaxis is underdiagnosed and undertreated in most pre-hospital care situations and EDs. About 1,500 people die each year in the U.S. from anaphylactic reactions to foods, drugs, latex, and insect stings. “Clinicians should recognize that severe reactions have the potential to be fatal,” Dr. Nowak says. “Those who die from anaphylaxis are oftentimes young and otherwise in good health.” Further complicating matters is that no single test can diagnose anaphylaxis or predict its outcome. 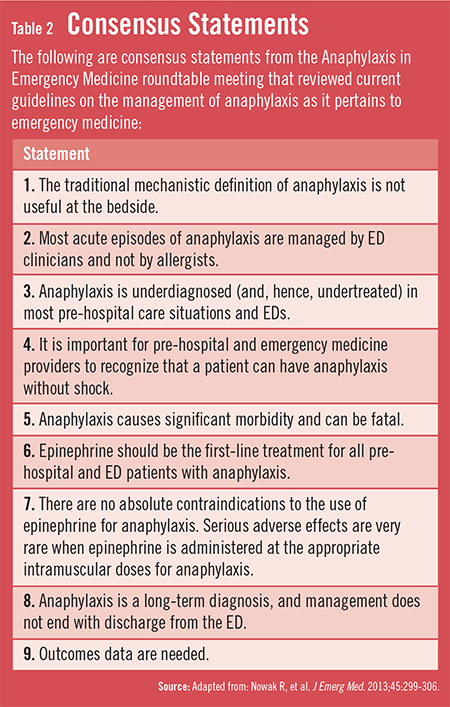 As a result, EM providers should appreciate the potential morbidity and life-threatening nature of anaphylaxis and recognize that multiple factors can increase the likelihood of acute episodes. Nowak R, Farrar JR, Brenner BE. Customizing anaphylaxis guidelines for emergency medicine. J Emerg Med. 2013;45:299-306. Simons FE, Ardusso LR, Bilo MB, et al. World Allergy Organization guidelines for the assessment and management of anaphylaxis. J Allergy Clin Immunol. 2011;127:587-593. Lieberman P, Nicklas RA, Oppenheimer J, et al. The diagnosis and management of anaphylaxis practice parameter: 2010 update. J Allergy Clin Immunol. 2010;126:477-480. Boyce JA, Assa’ad A, Burks AW, et al. Guidelines for the diagnosis and management of food allergy in the United States: report of the NIAID-sponsored expert panel. J Allergy Clin Immunol. 2010;126(Suppl):S1-S58. Richard Nowak, MD, MBA, FACEP, FAAEM, has indicated to Physician’s Weekly that he has in the past received travel expenses and an honorarium for chairing the anaphylaxis emergency medicine round table meeting in Chicago.